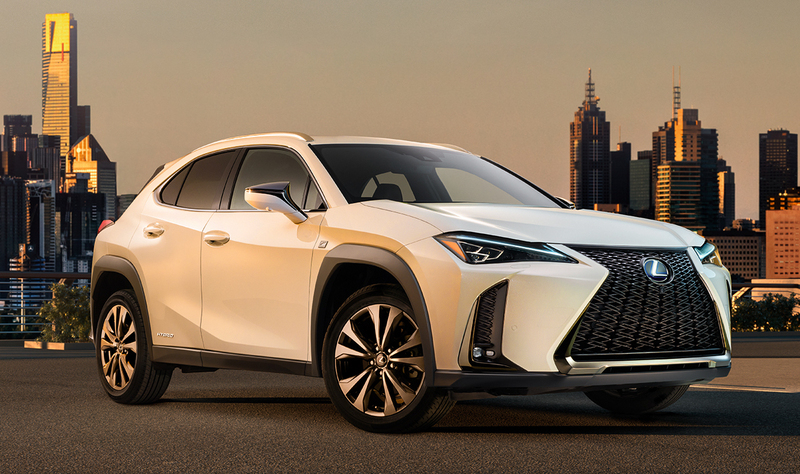 Lexus has revealed the production version of the Lexus UX Concept. The new small SUV will have its world premiere at the 2018 Geneva Motor Show next month. The Lexus UX will compete with the likes of Mercedes GLA and Infiniti QX30. From the original, concept version shown at the 2016 Paris Motor Show, it was expected that the Lexus UX will have a polarising design, and that is exactly what has happened. At the front, the massive Spindle grille takes up the centre, typical of any modern-day Lexus. This dramatic centrepiece is flanked by curvaceous headlamps consisting of triple projectors similar to those seen on the Lexus LC and L-shaped LED DRL. There are large vertical air vents and small fog lamps below them. On the sides, the Lexus UX has powerful fenders, squarish wheel arch cladding and dual-tone mirrors. The silver 'F' badge on the front fender confirms that the model seen in the first official video and image is in the F-Sport grade. Moreover, there’s a ‘Hybrid’ badge on the rear door to signify the particular configuration’s eco-friendliness. Lexus is yet to reveal the rear-end of the SUV but has teased a full-width tail light strip with retro tailfin-like ends. The interior of the Lexus UX looks heavily inspired by that of the Lexus LC with the positioning and design of various elements. The virtual instrument cluster, drive mode selector, engine push-start button and the dual-zone climate control system’s switches strongly remind of the flagship coupe. The central display is large and positioned high-up for providing a quick access to the driver with minimal distraction. A small analogue clock beside it is an elegant touch to the rather sporty vehicle. The Lexus UX's interior is quite reminiscent of the Lexus LC. The Lexus UX will go on sale internationally later this year. Lexus is yet to confirm its new baby SUV for India.